In the above U.S. Navy photo an F/A-18E Super Hornet attached to Strike Fighter Squadron (VFA) 31 and an F/A-18F Super Hornet attached to Strike Fighter Squadron (VFA) 213 prepares to launch from the flight deck of the aircraft carrier USS George H.W. Bush (CVN 77). 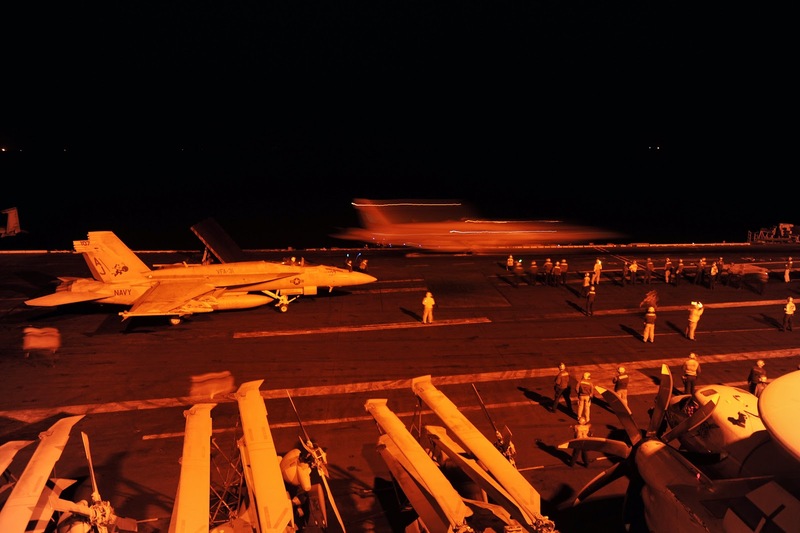 The carrier aircraft are conducting strike missions against ISIL targets. The George H.W. Bush is supporting maritime security operations and theater security cooperation efforts in the U.S. 5th Fleet area of responsibility. Note: The above U.S. Navy photo was taken by Mass Communication Specialist 3rd Class Robert Burck.